now let’s (hopefully continue to) presume this is about an exceedingly critical aspect, a make-or-break design decision. because surely, you aren’t spending precious project resources deciding whether or not to use 2 or 4 spaces per indent level! so, if sketching out the ideas and comparing still did not reveal a clear winner, then code up the competing ideas and put them to the test. give the designs a day or two of effort, or more — in proportion to the critical nature of getting the decision right. then, have some a priori metrics by which to pick the winner via “testing” the designs. and if you still can’t choose a clear winner, well, man-up, be a leader, and make a freaking decision (even if it is flipping a coin), and don’t look back. 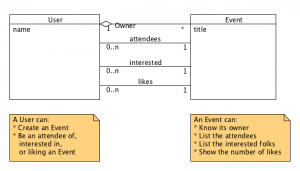 This entry was posted in agile techniques, modeling on October 4, 2011 by jon. Do I Still Do Domain Modeling? Got a very nice “blast from the past” contact (4 levels deep) on LinkedIn. Scott was a member of a team where we went through object modeling for their business application. First for some reason that training has stuck with me more that many trainings and I still go back to the cobweb section of my brain and bring it out every time I have a object modeling task, so thanks you did a good job helping me. This is true for many of the people that were there. Second as I have been given another task of modeling a large system from scratch I was wondering about how you feel about the Domain-Neutral model that was presented in the training you did for us. I have found it useful over the years but do you still use this model in anything that you design this many years in the future? And yes, I still do domain modeling the basic way that we did 11 years ago (gulp). I only have my old copy of Together anymore, so I am stuck back in time there. In person, I always use post-it notes, flip-charts, and markers. Once I want to make a computer version, I’ll use different tools for modeling depending on the need. For example, UMLet is a great little simple tool to bang out a quick diagram in no time flat and that can be used by anybody. Then looking towards the roles that may be at play there (yellows). Are there any specific things (like contracts, purchase orders — greens)? And finally, any descriptive elements (blues) to go alongside the greens? For the past 18 months, I am in major love with Ruby, Rails, and MongoDB — plus all of the surrounding tools and community (see my recent blog posts). Ruby the object-oriented language I wanted when I was doing C++, and MongoDB/MongoMapper is the OO-like DBMS that I always wanted. Putting it all together makes for real productive, high-quality, consistent development — I can quickly model out domain things and try them in a working application. That last bullet is key. I like to do just enough up-front work to please the stakeholders and myself that we can answer the question about: how much? and when? to the level of desired specificity. When you attempt a high-level estimate at a given feature, and it is too big for your comfort, then you can get more detail and break it down further so that it becomes acceptable. If you do not do enough up front, and your estimate is off by an order of magnitude or three, you might upset the client! On the flipside, if you do too much up front (detailed modeling), then you risk not getting frequent, tangible, working results into the hands of the client soon enough. It’s a big balancing act. This entry was posted in agile, agile techniques, Development, modeling, process on September 26, 2011 by jon. There was a question in the Google Group for MongoMapper, so I decided to post an answer in the form of a simple demo. You can find the source code on Github.com here. And the solution issues were around the multiple many-to-many associations, more or less. There are different ways to tackle these many-to-many associations. You can use a Set (to obtain the uniqueness factor) of Users that are attending or are interested. In which direction you allow making the association, that is up to your application’s needs. For example, above you can see that an Event instance could be messaged with the user to indicate attending or interested_in. 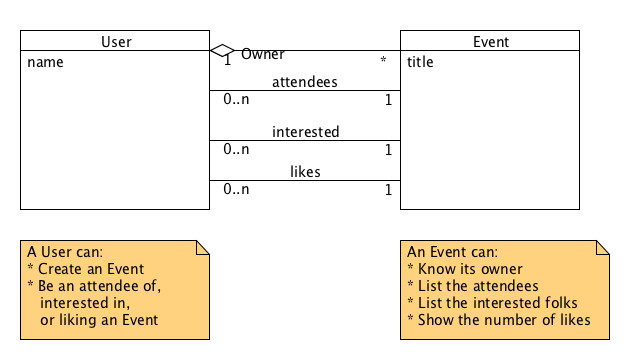 The “likes” is immediately accessible from an Event, or I could have added a wrapper method (def likes(a_user)). This entry was posted in Database, Development, modeling, mongomapper on April 17, 2011 by jon.